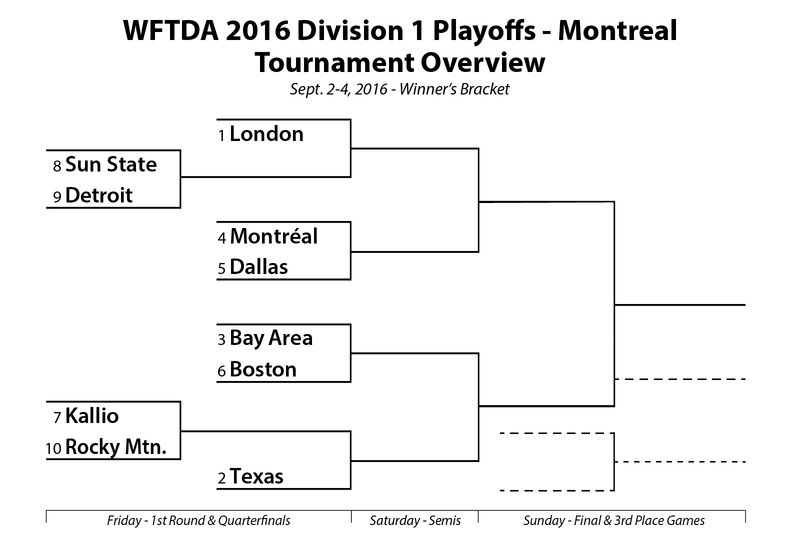 The WFTDA opens its Division 1 playoff season in Canada, with Montreal Roller Derby hosting the tournament in its home city. Five countries are represented by the ten teams coming to town to play some playoff roller derby. This has us slightly concerned for their well-being. Different countries have different laws. What’s illegal in the United States may be a-ok in Canada,1Like affordable public health care. and vice-versa. The particulars of Canadian society brings about other laws, ones that the scores of foreigners set to play and watch roller derby over the weekend may not be privy to. We’re most concerned about the sensibilities of a certain distinct and viable part of Canadian society. Wine drinkers. Pea soup eaters. Les Quebecois, the Canadians that put the French in French Canadian, are a big part of the region’s heritage and culture. As you may well know, the two official languages of Canada are English and French. Though English is spoken widely throughout the country, French is most heavily spoken in Quebec. To protect its French lineage—and to keep Quebec happy until its next political revolt—Canadian law requires that all documents and signage be written in both languages. We worry that some derbyfolk up there, especially fans that bring signs to display in the stands while watching games, may run afoul of these language laws. The last thing anyone wants to do is have a run-in with the authorities. Or even pay a fine! We here at Roller Derby Notes are here to help. To potentially head this problem off at the pass, we’re presenting this preview in a bilingual format! We’ll appease the Canadian language police in Quebec by adding a French translation to our ten capsule previews for each Division 1 team playing this weekend. Mind you, we have absolutely no idea how to speak French. But that’s not going to stop us! While Babelfish is warming up in the background, let’s make-do with a mostly-English review of the happenings from last weekend’s second Division 2 playoff tournament from Lansing. The Division 2 tournament season has quickly gained notoriety for producing a lot of close games. Last year was especially crazy. Maybe too (in a good way) crazy, because this year hasn’t quite been able to keep pace. There were only four 100+ blowout games in D2 2015. This year there are already nine of them, including two very bad 200+ blowouts. This is hurting the average margin of victory, which last season was close to 50 points. Though we anticipate it will go down after some seat-of-your-pantalons action at Champs, at the moment it’s sitting at 66 points. That’s not stopping super-close games from happening, obviously. We classify the really, really good ones as OMG!!! games, those that are both close at the end and close throughout.2For more on the OMG!!! game and how we define it, see last year’s Playoff Exstataganza. We counted three of these in Wichita, and another three of them in Lansing. There were eight in total in D2 last year, so that’s a number that’s staying on track. Tri-City’s Crazy Squirrel found herself off the track—then over the apex, around the Nidaros defensive wall, and landing back on it while calling the jam—during the incroyable last-moment come-from-behind victory in a Saturday morning game in Lansing. Watch it if you missed it. If you did watch the game, you probably didn’t miss something else that happened during it: 92 penalties. That’s a lot. Other games on the weekend also had a lot. In fact, what happened last weekend wasn’t exactly WFTDA roller derby at its finest, even with the handful of tight games and close finishes. In contrast to the opening tournament of the Division 2 season, which had a very encouraging average of only 65.8 penalties per game, the 85.3 per-game average in Lansing—more than last year’s overall D2 penalty average—is hard to explain. The closeness of the D2 field has led to a lot of consistent data that we’ve tracked over the four years the tournament has existed. For the past three years, there hasn’t been much disagreement on the number of penalties called at the two playoff sites or at champs. Give or take five calls, the number of penalties committed was pretty much the same regardless of where the tournament was held or what ref crews staffed them. But this year? A 20 penalty swing is big enough to raise an eyebrow,3For the supposedly-consistent nature of the Division 2 tournament, anyway. There was an 18-penalty swing between two tournaments in Division 1 last year, but with more blowout potential a more volatile environment for penalties can be expected. 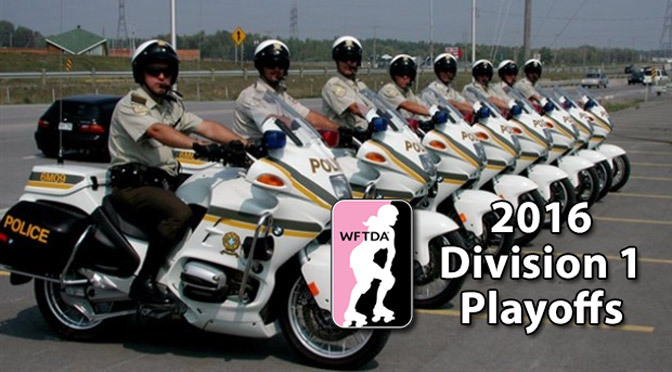 especially after everyone had a extra year to practice with the unchanged WFTDA rule set. We’re not insinuating anything here, just wondering what an explanation could be for this large inconsistency in the most consistent gameplay environment the WFTDA has. We’d also like an explanation for the stellar performance of Charlottesville. While everyone around them was riding the pine with high frequency, they were staying five strong at an exemplary rate, one that helped them get all the way to the Division 2 finals. They were defeated by Calgary in the Lansing, however. As the second placed-team, C’ville will play Wichita winners Brandywine in Portland, with Calgary facing the other runner-up in Blue Ridge in the Division 2 games that open WFTDA Championships this November. Bien! It appears that the language police aren’t very happy with our light use of French up to this point. Je suis vraiment désolé! We’re fixing that now. Have a look at the relavent part of le support en séries éliminatoires pour Montréal is below, followed by our held-at-gunpoint bilingual previews for each of the ten teams. *Disclaimer: The author was writing the French parts out as fast as he could, fearing for his life, despite having little knowledge of the language. Management cannot be held liable for any typographical or syntax errors. C’est la vie! London played four games in two days at the European Smackdown in March, finding no resistance whatsoever. (They beat Glasgow, ranked #29 at the time, 526-9. Glasgow is now ranked #103.) It could be said that the Brawling’s 2016 regular season was really just against one opponent: Gotham. They two giants played in London on June 25. Though Gotham took the 149-118 victory, London outscored Gotham in the second half 77-70. A loss is still a loss, but that’s a moral victory London can build on as it begins its real season en route to Champs. Londres a joué quatre matchs en deux jours au Smackdown européen en Mars, trouver aucune résistance. (Ils ont battu Glasgow, classé n°29 à l’époque, 526-9 Glasgow est maintenant classé n°103..) On pourrait dire que la saison régulière 2016 de la Bagarre était vraiment juste contre un adversaire: Gotham. Ils ont deux géants joué à Londres le 25 Juin Bien que Gotham a remporté la victoire 149-118, Londres ont dominé Gotham dans la seconde moitié 77-70. Une perte est toujours une perte, mais qui est une victoire morale Londres peut construire sur comme il commence sa vraie saison en route vers Champs. The good news: Texas hasn’t lost to anyone ranked below them in the WFTDA this year. The bad news: Texas hasn’t beat anyone ranked above them. All four Texecutioner losses have been against the types of teams that they’ll need beat if they want to have a chance to medal at Champs. Fifi Nomenon elected to sit out most of the regular season for Texas, but she is expected to join back up with her team in Montreal. It’s a jamming boost that should see Texas advance to Portland, but still probably not close to the level of London to vie for the divisional title. Les bonnes nouvelles: le Texas n’a pas perdu à personne classée en dessous d’eux dans le WFTDA cette année. Les mauvaises nouvelles: le Texas n’a pas battre tout le monde classé au-dessus. Les quatre pertes Texecutioner ont été contre les types d’équipes qui ils auront besoin battre si elles veulent avoir une chance de médaille aux Champs. Fifi Nomenon élu pour siéger à la plupart de la saison régulière pour le Texas, mais elle devrait se joindre à remonter avec son équipe à Montréal. Il est un coup de pouce de brouillage qui devrait voir le Texas avance à Portland, mais probablement pas assez grand pour attraper plus de deux poissons sur les plages de sable fin. Bay Area has played, and won, in two tight games. They beat Denver, ranked one place above them, 186-174 at The Big O. Terminal City gave the black and gold a stiff test at Pac Destruction, but fell five points short punching above their #20 WFTDA rank. If they can get past a tricky Boston team in their first game, Bay Area will get a rematch against Texas in the semis. They played against each other earlier in the year, also at The Big O, where Texas cleaned up with a comfortable 149-84 win. Depending on how the games on the other side of the bracket go, a repeat of that result could land Bay Area in the third place game against a decidedly partisan crowd. Bay Area a joué et gagné, en deux matchs serrés. Ils ont battu Denver, classé un endroit au-dessus, 186-174 à The Big O. Terminal City a donné l’un test rigide noir et or à Pac Destruction, mais a chuté de cinq points à court poinçonner dessus de leur WFTDA rang n°20. Si elles ne peuvent aller au-delà d’une équipe de Boston délicate dans leur premier match, Bay Area va obtenir un match revanche contre Texas dans les demi-finales. Il est ici où les deux équipes peuvent comparer et échanger des recettes pour poutine et pâté à la viande, puis se livrer à un jeu post-bake-off. Les gagnants seront célébrer! Les perdants vont pleurer dans leurs verres à vin. The hosts will enjoy significant support from their home crowd. (We assume, in both English and French.) They’re going to need it this weekend. Montreal has never made it to Champs, falling 28 points short against Minnesota in their 3rd place/play-in game last year. This may be their best shot yet. Before last year’s push towards the Championships, Montreal has traditionally gotten tripped up in the 4/5 Friday matchup, the toughest of the day. That’s where Montreal again finds itself this year. If Les Skids aren’t careful, they may get knocked down into the the lower bracket straight away for the third time in five years. Les hôtes pourront bénéficier d’un soutien important de leur public. (Nous supposons, en anglais et en français.) Ils vont avoir besoin de ce week-end. Montréal n’a jamais fait à Champs, tombant de 28 points à court contre Minnesota dans leur 3e place / jeu de jeu dans l’année dernière. Cela peut être encore leur meilleur coup. Montréal a toujours obtenu déclenché dans le 4/5 vendredi affrontement, le plus dur de la journée. Pourquoi ne pas essayer un jour férié au Québec cette année? Voir les beaux lacs, le système téléphonique merveilleux, et beaucoup d’animaux à fourrure intéressants. Y compris les orignaux majestueux! Un orignal une fois mordu ma sœur. Woah, Dallas! Though the WFTDA has you down here as the 5th seed, Flat Track Stats and their knack for accurately describing a team’s current strength pits you as the third-best team playing in Montreal this weekend. A strong finish at the playoffs last year, with some triple-digit wins over lower-ranked playoff teams since then, contributed toward that nicely. Though the game between Montreal and Dallas is expected to be close, FTS puts Dallas at a 2-to-1 favorite to finish with more points than Montreal when all are added up. If Dallas can pull out a win, that would give them a shot at making it to Champs. A longshot, admittedly, but a better one than Montreal would have at that point. Rappelez-vous, les piqûres d’orignaux peuvent être assez méchant. Boston played Montreal at ECDX, but lost 239-142. That’s not a result will help them should the two teams face each other again, potentially in the consolation bracket. More pressing for Boston is their first game against Bay Area. The teams didn’t meet previously, but Boston hosted near-ranked #13 Philly in May. That was a 32 point win for Philly. If Bay Area is a little stronger than Philly, at least according to the rankings, than Boston should have a little more trouble against them in their opener. If that leads to the expected result, a loss, Boston fans shouldn’t fret. The team has a good chance of winning out and getting another 5th place finish. Je parie que la plupart d’entre vous ne sont même pas avoir vu ce gag. Vous êtes juste écrémage sur les trucs français et en supposant que la traduction est exacte, mais peut-être que vous n’êtes pas plus si sûr. Les locuteurs natifs doivent penser, ce que le genre de français de l’enfer est-ce? Quoi qu’il en soit, au moins je ne suis pas à vous soucier de la police de la langue plus. Ces gars-là ne sont pas si difficile! Oh! Quel est ce son? … Uh-oh. Welcome to the playoffs, Helsinki! No, not that Helsinki. The other team from the Finnish capital. Kallio is making its first post-appearance. Unfortunately, it may be a quick exit. Flat Track Stats has Kallio ranked #57, almost 30 ranks below their WFTDA ranking and by far the lowest-ranked team by FTS playing in Montreal. Then again, the team made a meteoric rise up the WFTDA ranking table in the past few months. In April, the team was #70. In May they jumped up 19 spots to #51, and by the cutoff in June they leapt up another 24 to settle at their current rank, good for a 7-seed this weekend. Kallio lost to their rank-neighbor Rainy City by 42 points in June, but had very similar triple-digit wins against the similarly ranked Auld Reekie and Bear City, teams at the bottom end of the Division 2 playoff picture. Je vous écris ce message de corps sonore et de l’esprit, et de ma propre volonté. Mes ravisseurs me traitent bien. Ils me ont fourni des crêpes et du café, et une sélection de matériaux de traduction anglais-français. Je suis informé que je dois respecter les lois canadiennes de langue immédiatement, ou il y aura … problèmes. Dites à mes amis et la famille que je suis sûr, et que je les aime. The Queenslanders had the bulk of their sanctioned schedule take place in April and May. First they cleaned house against up and coming Australian teams, then came to the states and claimed a victory over #22 No Coast (213-153). They did lose handily to #19 Team United 236-78, though. Where they finished last year, and where they are seeded this this weekend, is a good predictor of where they may place in the tournament this year. Je désespère. Les Québécois se moquent de mes traductions en français. Je fais le meilleur effort que je peux, mais leur railleries est implacable. (Ils doivent avoir ramassé du vrai français. Tsk.) Tout ce que je voulais faire respecter leurs lois linguistiques! Mais maintenant, je ne peux même pas payer l’amende $1,000 canadienne à sortir d’ici. Ils auraient accepté $10 américain, mais je passé mon dernier peu d’argent au Tim Horton sur mon chemin. Detroit is well-positioned to do some damage in the lower brackets. Flat Track Stats has them well above their WFTDA ranking, and if that holds against their opener versus Sun State, they’ll rematch with London. Detroit made the trip across the Atlantic early this year to participate European Smackdown, where they received a London smackdown through a 345-79 loss. The pattern for Detroit in 2016 has been either winning big or losing big. All but three of their games ended in triple-digit margins, win or lose. Their closest game was an 11-point win against #30 Stockholm (ranked #11 at the time). That game, as well as recent wins over #20 Tampa (+59 points) and #33 Ohio (+246) last month has shown that Detroit is looking very strong for a 9-seed. Je suis libre! Je suis libre! Il est incroyable de voir comment facilement distrait québécois sont par la soupe aux pois. Je viens de jeter un bol à leurs pieds et ils trébuché sur eux-mêmes se battre pour elle. Voilà quand je faisais ma pause! Oh, je peux avoir accidentellement détruit la moitié de la station de police avec un accident de micro-ondes fortitous. Mais ils ont commencé totalement. What a difference a year makes. Rocky Mountain, a perennial contender at regional, divisional, and championship tournaments, barely made it to the Division 1 scene this year. They played a good number of games against top-20 teams (all losses) and a lot of games in general to smooth out the bumps in the road. After losing some jammers to transfers, the team needed the whole year to figure themselves out. They opened with a 35-point win against #58 Boulder County. Two months later they beat them again, this time by 102. After that they took on the likes of Denver (-219), Texas (-235), and Gotham (-327), then got tripped up by 5-seed Dallas 160-88. Despite all of that, Rocky was able to hold on to a Top 40 spot and will be playing in Quebec this weekend as the last team invited. He huido Canadá y salté sobre esa pared de 10 pies en México. La policía canadiense lenguaje nunca se me va a encontrar ahora! He tenido que disfrazarme de México, por lo que con perdón de la traducción francesa horrible. Por lo menos yo estoy haciendo la práctica para el primer torneo de desempate WFTDA mexicana. Eso va a ser muy pronto, ¿si? Previous PostWFTDA 2016 Division 2 Playoffs: Auld LansingNext PostWFTDA 2016 Division 1 Playoffs: Colombia or Columbia?